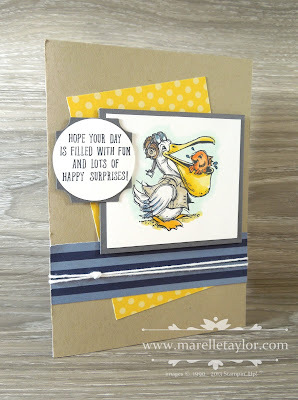 Here is my second Postcard Pals card, this time with Mr. Pelican. He was also lots of fun to colour. I've gone with the same layout as my Otter card, and just changed some of the colours to suit. For this one I also did a more 'nautical' style of knot in my twine, and punched out my sentiment. I hope you're enjoying these cards...I have one more Postcard Pal to show you next time.